Although the world of colors is gorgeous and varied, but simple black and white, is been recognized as a "classic color match" publically. In a variety of new product launches of varied fashion brands, you will the see the cool black and assuming white style always. Black and white are colors full of spirit, they are colors that never outdated. Although the black and white are entirely different, each has their own way, but as long as mastered a right proportion between the two, they will blending well too, and create a harmonious, clean home space, and bring senses no matter modern or classical easily. 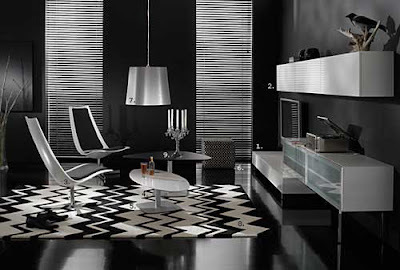 When using black and white to decorate your room, you should arrange a right proportion between the two "extreme" colors careful. Black and white, who is the leading actor in the end? If you are enough special as well as enough alternative, you can make black to dominate the market, and let the living room become the world of black: black sofa, black desk/table, black seats, black ceiling and black backdrops, and let black take the way to the end. Under the shadow of such a mysterious atmosphere, white may turn into embellishments naturally, for example, white floor lamp, white tea set, white vases, thus to create an unique and fantasy shaped space. 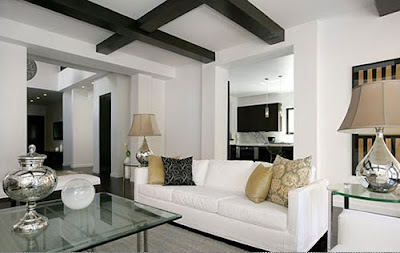 However, if you can not endure repressions taken birth from a mass of dark, you’d better to take the fresh and clean white as the main tone, for example, white walls, white floors, matched with black sofa, transparent glass windows encircled by black frames, white curtains dotted with black dots, so simple white will become lively and dynamic. Concise style furniture with smooth lines matched with simple, bright, clean and spacious bedroom is forever an ideal choice, which will bring you clear, pure, clean and solemn feelings. While those blue cushions, hemp yellow carpet, red flowers, these ornaments will take more rich layers to the whole space, as simple in overall and exquisite in small areas, these details will show the exquisite and delicate taste of living of the owner casually.